It is with much excitement and trepidation that I’m starting this writer’s blog. I suppose the main reason why I’m doing it is because I think it would be a fun outlet. Plus, I want to keep up my writing skills, document my adventures, maybe look back and laugh a little. So why, Girl Friday Makes Good? To start, I am a woman who has had various jobs in her life, and my experiences make for good stories. 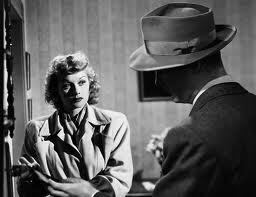 Plus I love Firm Noir, and I’m a nut who wrote her college thesis on the Girl Friday. I gave it to UC Berkeley; it’s somewhere in their film library. When I think about it, I’ve been working as a Girl Friday since I was about fifteen years old, and this is the first time in my life that I am not a part of the 9-5 world. It has been a strange yet surprisingly easy transition for me. I’m keeping pretty busy reading, writing, cooking, volunteering and creating all day long. Plus, I still take the necessary trips back and forth to the East Bay to work on our property. Still, this is a very different life from the one I used to live. One thing is I’m working for myself and my family now instead of for an employer, and the fruits of my labor are all mine. Another thing is I seem to have more time to think and be quiet now that I’m living away from the city. I’ve been thinking about my relationship with Jesus, and about my place in the world, and it makes me want to get busy. I’ve started volunteering for the first time other than the undergraduate volunteering I did while attending UC, and I’m full of new thoughts about the future. Living in the boondocks, I find I’m more excited about life than ever before. Go figure.